Sri Ramakrishna says that there can be as many spiritual paths as there are spiritual aspirants. Extending this further, we can accept as its corollary that there can be as many gods as there are devotees. As long as the central fact, viz., that these gods are the doorways leading to the one Godhead, is not forgotten, polytheism, pantheism, henotheism or 'any-theism' is acceptable. The bewildering variety of the Hindu gods should be viewed from this angle. An unbiased, if not reverent, study of the Hindu gods and goddesses can convince anyone of the rich symbology they represent. Contemplating on them symbolical significance will help us to be raised to more profound levels of spiritual experience. 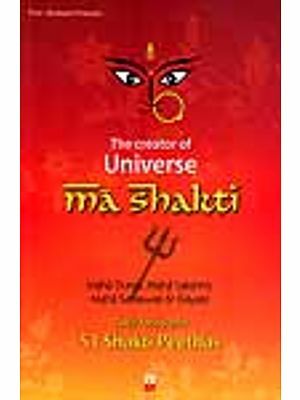 In this booklet a humble attempt has been made to unravel the symbolism of Devi and her various aspects. 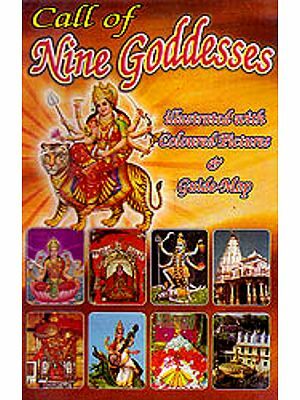 We earnestly hope that it will provide the readers with a basic knowledge of these deities and rouse their curiosity to know about the other deities of the Hindu pantheon also. 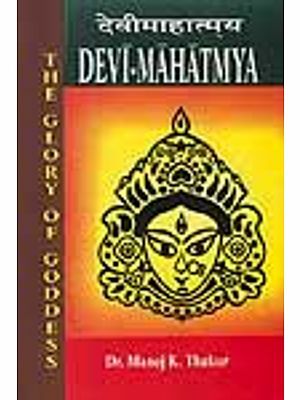 Readers who may be interested in a more comprehensive study of the deities of the Hindu pantheon are advised to go through my book, Hindu Gods and Goddess, published by the Sri Ramakrishna Math, Madras. 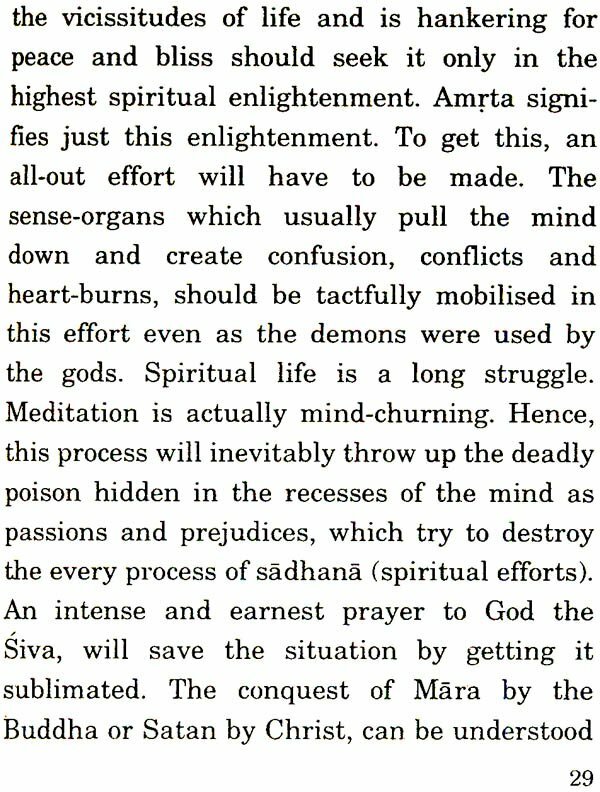 Sri Ramakrishna says that there can be as many spiritual paths as there are spiritual aspirants. Extending this further, we can accept as its corollary that there can be as many gods as there are devotees. As Iong as the central fact, viz., that these gods are the doorways leading to the one Godhead, is not forgotten, polytheism, pantheism, henotheism or 'any-theism' is acceptable. The bewildering variety of the Hindu gods should be viewed from this angle. 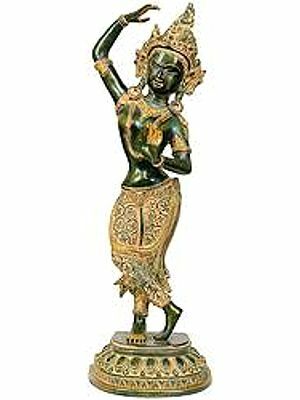 An unbiased, if not reverent, study of the Hindu gods and goddesses can convince anyone of the rich Symbology they represent. Contem plating on them with a proper understanding of their symbolical significance will help us to be raised to more profound levels of spiritual experience. 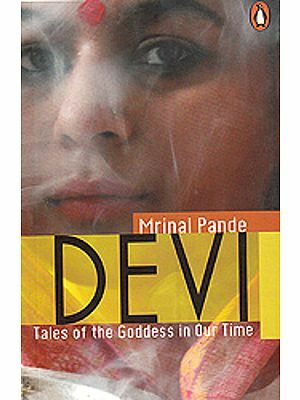 Readers who may be interested in a more comprehensive study of the deities of the Hindu pantheon are advised to go through my book, Hindu Gods and Goddesses, published by the Sri Ramakrishna Math, Chennai. The universe that we see and experience is a bundle of energy, both packed and unpacked. This is the discovery of modern science, which incidentally, has demolished the distinction between matter and energy. According to it, there is one basic energy behind all forms of matter and energy. However, it seems to be still far off from discovering the relationship between matter on the one hand, and, mind and life on the other. Are they also, though apparently poles apart, manifestations of the same basic en- ergy? Could it be that the same energy or matter, at one level of vibration is called 'matter,' at another, 'mind,' and yet another, 'life'? Modern science or the modern scientists, devoting most of their attention to the manifest material universe may not even be prepared to concede this possibility! Hindu philosophy, based on the Vedanta, and, a group of works based on the Vedanta and more commonly known as the tantras* postulates exactly this! The source and sustenance of all creation, whether at the level of matter or life or mind, is one and one only. It is Sakti (= energy). Brahman (the Absolute) of the Vedanta and Sakti or DevI of the tantras are identical. When that 'energy' is in a static condition, with neither evolution nor involution, when the universe to be created is not even in a seed-form as it were, it is called Brahman. When it starts evolving into this creation, sustains it and withdraws it hack into itself, it is called Sakti. If Brahman is the coiled serpent in sleep, Sakti is the same serpent in motion. 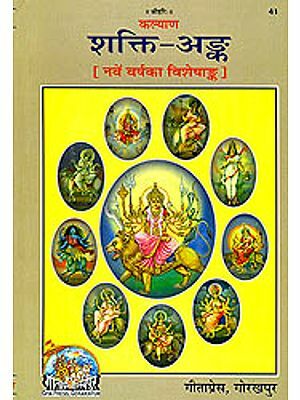 If Brahman is likened to the word, Sakti is its meaning. If Brahman is like fire, Sakti is its burning power. The two are inseparable: one in two and two in one. 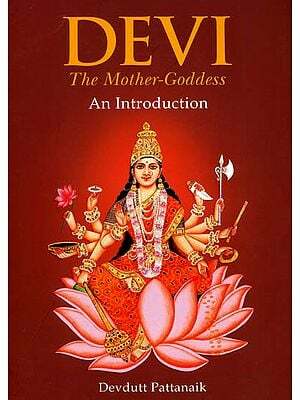 In the Hindu mythological literature, as also in the tantras, this energy is always pictured as a female deity, the Devl, as the consort of its counterpart male deity. Each member of the Trinity has his Sakti or Devi as his consort: Sarasvati of Brahma, Laksmi of Visnu and Parvatl of Siva. 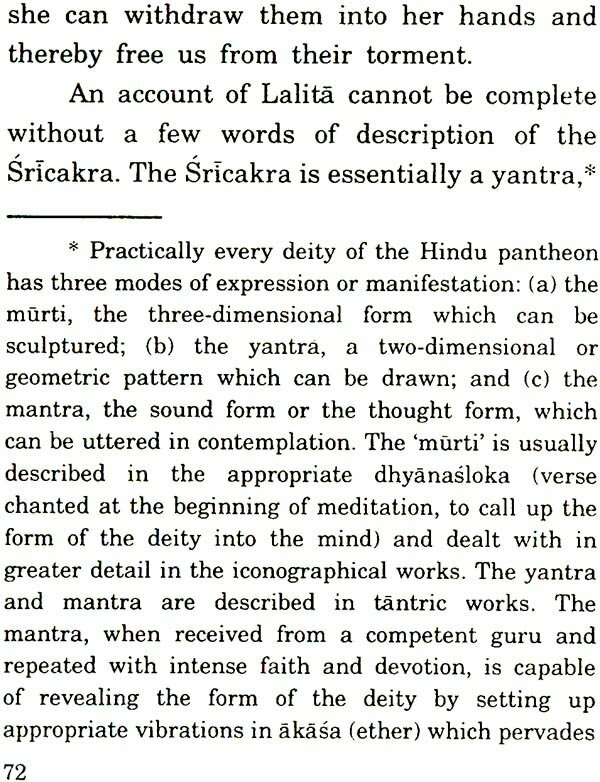 However, the mother-cult that has evolved over the last few centuries, is predominantly centred round Parvatl, the consort of Siva. Mother-worship and mother-cult are not alien to the Vedic religion as some suggest. 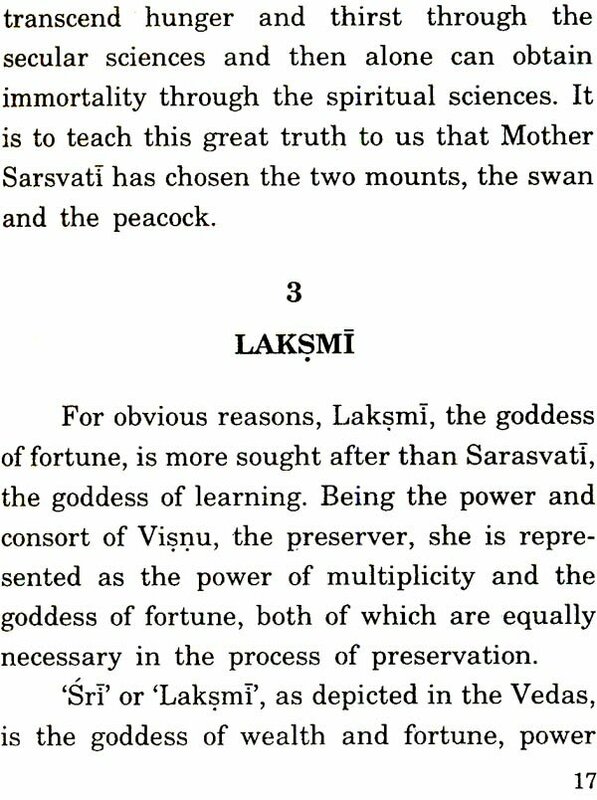 The concept of Aditi, the mother of gods, personification of nature and the Ambhrni- sukta as also the Ratrisnkta of the Rgueda clearly contain the origins of Mother-worship.